She is absolutely beautiful… thank you for posting this! Beautiful – she looks like she’s got some serious stories to tell. what an elegant pose, beautifully captured. If you breath you are headed that way…she looks great. I imagine her outfit reflects her vibrancy, or vice versa. Lovely photo capturing this lady’s personal elegant style. It’s not often that we get true advance style in fashion blogs. You know what I really like about this? Her stoic posture. What a lovely grandma in a summery frock. Her face is approachable and kind. While I know all the people you photograph are “real”, this is a wonderful breath of fresh air. I love the look on her face and that she is wearing such vibrant colors. I love diversity in your work! What a delight! I absolutely love this picture of a proud older woman! And the bridge as backdrop is a wonderful setting. Her pose is the best part of this photo. She’s proud and confident; she stands tall and strong. Many women seem to shrink into themselves as they get older, and I don’t mean physical bone loss–they seem almost to be trying to disappear, to apologize for not fitting the dominant standard of youthful media-Barbie “beauty.” This woman’s still owning it. I envision her having posed this way all her life, and I honor her knowing that she’s still that woman. Great to see this ‘Advanced style’-like post. I like the cheerfulness of her dress. So lovely to see an older woman with such style! What a fantastic dress- The bright colours look amazing on her. She reminds me of my own nana…a great sense of style that is fun and comfort combined.. Doesn’t this just says summer to you when visiting nana??!!.. She is absolutely gorgeous! Fresh, bright and colorful!!! And that necklace, LOVELY!!! I love this! Such an intelligent and confident looking woman. If only I could join her for coffee and hear her story. Amo i Navigli, amo lei e amo te per averla pubblicata! I love Navigli, I love her and I love you for that! It’s always lovely to see granmas looking colourful and modern. Look at this lady! with her flowers, her pearls… she looks great. You go girl. Never too old to celebrate color and look good. Nice photo. a lovely print, i love the colors and the flowers. She must be a cool grand’ ma! I love the geometry in this composition. The setting seems to push the woman forward. Nicely done. This beautiful lady gives me the hope that I can age as gracefully as she has. I love her confident pose and her outfit is spot on ! I agree with of comment that says she is not shrinking in the background but she is proud of who she is. This is great. More like this please. Beautiful and stylish!! Love her! Love this! She looks so happy within herself and I just love the print on her dress. Che bella nonna! Great picture! Wow, great photo! I’m totally picturing a charming story behind it! I really love this picture because it’s a different view on style and shows what other street style blogs neglect: real life ! Thank you for taking genuine snapshots that capture and generate emotion. I appreciate that you took this picture and that you see beauty in her. She is plump, fabulous and inspiring! So elegant! She looks great! Gorgeous dress, perfect shoes – lovely! In Greece the women at her age don΄t dare wearing colourfull clothes!So this woman makes me happy! A lovely shot – she’s absolutely of the moment, and her style is so simple and vivid. Great photo. She is wearing a fun colorful dress, but her pose is really the best part. She is proud and confident. Good for her. Thank you for showing us people beyond 50 who are stylish. Really: Thank you. I had never posted any comment in this wonderful site. The shots are incredible and real at the same time. I cannot go to bed without checking the new pictures. This one is simply astonishing. Pink and red and yellow and blue all together – and she makes it work! She’s matching her hair, necklace and the buttons on her dress too. Lovely! I love it! Style that continues beyond our “younger years” is truly classic and attractive. This reminds me of my own stylish mother, who is 70+, but you would never believe that, as you can see in this post http://www.shoeaxis.com/2012/05/sole-inspiration-dedication-to-mom.html. Thank you for highlighting a beautiful, stylish older woman! We can all aspire to this! The prototype of the Italian grandma! Love this! LOve Love LoVe it!!! I’m so glad! something different than the skinny young models! My first reaction is “Aww, she’s so cute!” Probably not what she was trying for but it certainly made me smile. I love to see Ladies of Certain Age take pride in their appearance. She reminds me of my grandmother who always wore dresses. Lovely. I think it is as important for a fashion blogger to feature photos of (ordinary) seniors as of swanky young people. The former could be an inspiration to the young on how to age gracefully and fashionably. After all the seniors of today may be trendsetters in their yesteryears. We may learn a thing or two from pictures like this. Love the elegant pearls and the immaculate hair. Very ladylike. And she is cute! Dignified, but cute. Love her. This could be me in 40 years. I definitely hope to make it long enough in this life to be as beautiful as this women. Just wanted to add that I see some older American women who dress divinely. More casually, perhaps, but thats not the point. We don’t live in a cookie cutter world, thankfully. Also; This lady does have amazing posture. its funny how people forget good posture, but if you don’t have that, you don’t have anything. 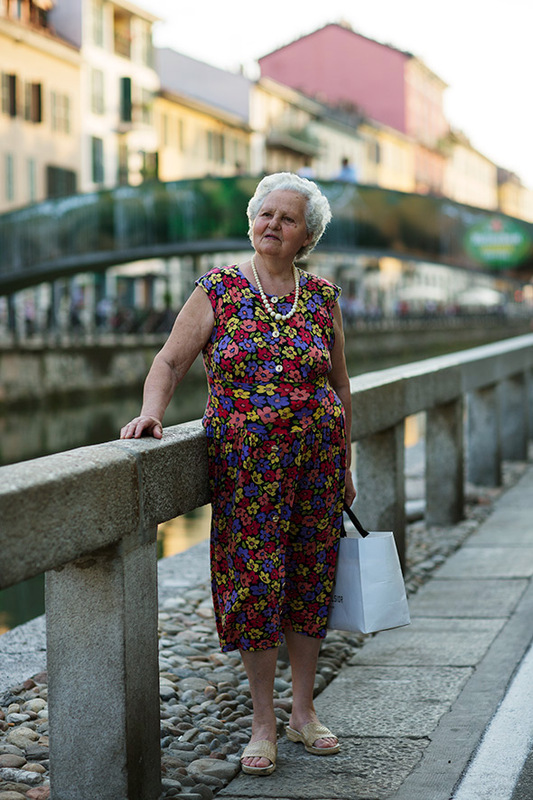 Really Italian granny summer street style… so MeH!!! Thank you for taking photos of everyone. I love her pose (as others have said) and the fact that her clothes fit. This is the number one quality I noticed in all the older women I saw when I first went to Spain–that older women wore clothes the right size–not too big, not too small. Whether they were 4 feet 10 inches tall or nearly six feet tall and round all over, their clothes were just the right size and they carried themselves with such grace. It was such an epiphany. Your portraits surprise us all the time… how I do love photos of the old ladies. My all-time favorite is the monochromatic lady wearing, what was it, a fur coat? I’ll have to find her in the sartorialist archives. Joy awaits! Had to comment for the first time to tell you how much I loved this. Being one’s best never gets old. Lovely! I think I love this photo the best. – I bet she feels as young as you see her in the pic. Embrace–and post–more lifetime beauty, like this one! Oh thank you for this one. Like a breath of fresh air. A smile on my face and a tear in my eye. I love this photo very much! Scott, thanks for a fabulous non fashion week glamour photo. Big smiles after seeing this. the beauty enclosed by wisely accumulated time. enjoy this photo very much!!! she looks beautiful!!! She looks so kind and beautiful. I love this photo. Is she Italian…i don’t think so…she looks like a German tourist! she was nice to pose for u! SO WONDERFUL! Keep showing us pictures like this, unexpected and delightful. She seems so complete! I love her. Thank you for posting this! at last!! this is a sign of dimensionality to enrich this wonderful website. thank you! she is marvelous. She’s beautiful and so confident! I love the photo. I’m imaging the smells that come out of her kitchen. Love her. Oh ! So nice picture ! That’s a original Mamy ! My fav pic. I would wear that too!!! This is SO lovely! I want to go to Italy! What a sweetheart, I love photos that capture elder in the style! Is that the girl in the previous photo 50 years in the future? …a very pretty dress in a wonderful print…love the three buttons & I bet her necklace is real mother-of -pearl….all in all a great lesson in how to dress for a summer day. Another beautiful shot. She has aged gracefully! Thanks for sharing. Esto si que es verdadero. Esta señora tiene estilo y es real!!! Brings a smile on my face. Colourful woman! ¡Enhorabuena por publicar esta foto! Las personas mayores también tienen su estilo y personalidad encantadora. lovely!nice to see people of all ages looking at their best! inspirational. Congratulatiosm for your choice. I think middle aged wnd old women have many stories to tell. And they deserved the same attention, in fashion, to show. A breath of fresh air. Such an elegant, beautiful lady. Thank you. As an American woman, I find it extremely helpful to embrace a more European attitude toward aging. When I feel the shove of our culture to deny that it’s happening, or that in fact, it is both natural and beautiful, I will think of this photograph. Thank you. What a lovely photo, great playsuit too! This photo really made me smile! Could totally see a woman decades younger wearing the same thing! I love the pose. She looks so proud and strong. In a way, this photo made me smile. This is basically my mum’ summer uniform and she would never consider herself classy, or elegant, or interesting in any way wearing such an outfit and she would never go to Milan wearing that because she wouldn’t consider it good enough for the city (she is from a small Italian town). I’m sure if you had asked my mum to take a picture of her she would have thought it was a joke. I would really like to know if you had to spend a lot of time trying to persuade this woman to take this picture. More senior people, please!!! Most times senior people are so classy, but when you piont it out they look at you like if they didn’t know what you’re talking about. I love her outfit, with the string of pearls, and the neutral shoe … thank you for posting this … it’s refreshing. So wonderful to see an older woman featured. Ever think that she may be much more than a “grandma?” Maybe she owns a business, maybe she is an academic . . . . images change and photographers help change them. I very much appreciate this! Thank you for posting such an elegant, stylish older woman. Keep an eye out for more…they’re everywhere and need to be seen! Glad to see Saba’s comment – I was getting a little tired of all this ‘cute grandma’ stuff. As a 62-year old myself, I hate the assumption that all individuality, all accomplishments can be disregarded after a certain age. She’s a mature woman who, to judge by your photo, is confident and with a strong sense of style. Nothing wrong with being a grandmother, but none of your readers would think of describing a 30-year old as simply a wife or mother – please grant older women the same respect. The best fashion picture ever! Italian neo-realism at it’s classic best. La bella donna io amo! Che bella. i feel like this picture tells you all about her. she’s a sweet yet fashionable italian woman, living it up in milan….with linguini cooking in her cozy kitchen….and fresh veggies that she just picked up from the market. I am also a bit annoyed with all these “cute grand ma” stuff. MAybe she is not a grand mam at all, maybe not even a mum?! Maybe she is an stylish italian lady with a very rich life, or maybe she is a tourist on a roundtrip to Italy? ( not German anyway, that you can tell ) but she could be Italian or even Danish. She is graceful and stylish and she looks very good and stylish. My grandma used to dress like that, dye her hair black, and she was much much more than a mum and a grand mum! This photo is a relief. I love to see all the beautiful , young men and women everyone takes photos of, and yet there is an older generation, with great style and beauty and a sense of self that lives and breaths that is largely ignored. It s nice to see that someone is paying attention. Your photograph is a nod to maturity and grace. she reminds me of my own gramma. thanks for posting this scott. Absolutely. This is a truly informative post, because it’s about classic and every day style we all need to remember. Nonna is rocking that floral jumper. LOve grannies wearing floral dresses! Looks like a cute woman. So cute! Pretty cool, good to see some normal folk on here. Makes the rest of us “non-jet-set’n” street style blogger feel up to par event to you. I’m sure she was super flattered. If you put the same clothing and accessories on Giovanna Battaglia, Viviana Volpicella or even Hanneli Mustaparta you’d have the same result. Something chic, lively and current. I like the bright print with the neutral shoes. wonderful picture with the explosion of colour in a more subdued background. I also like it because this is the first I see with a “normal” person in it, not the very slim, very young, waifish character, so close to the runway ideal. Beautiful, makes me love my gorgeous grandmas. MORE of these kind of women!!! Beauty at every age – love it! Oh …. Bella Nonna !!!!!! Fantastic! You need to take more photos like this. This photo made my day! Love it!!! i bet this lady is pretty cool. Amazing! Style does not understand about age…! Yay!!!!! Finally something different! A lovely looking woman!!!! bella, sencillamente bella. Adoro tu sensibilidad. This is so cool! My boyfriend is Italian and his beautiful mum is one of the most stylish women I’ve ever seen…at the age of 82!! I love the colours and the pearls that this lady is wearing, and as others have said, she has a tender, approachable face. Just great! Whenever I make the acquaintance of an elder, I pick their brains; I’d have to ask this lady about Coco Chanel and Elsa Schiaparelli. So many comments use the word “cute,” but that’s the last word I would use. She looks proud, resilient, strong, experienced, tough, and handsome to me, as the word is sometimes used for women. Love this! Yeah, this made me smile. Awesome. I don’t know what I love most about this picture. Thanks for posting this. I wouldn’t have looked twice unless someone else brought it up. She has so much fashion sense in such a discreet way. I absolutely love it. Brilliant!!! She is so true. She could also be Spanish. Nice that you’ve chosen this lady – after all, you do see charmingly dressed older people like this quite regularly across Italy – but I think you ought to do this more often to avoid this being seen as merely tokenistic. The non-fashion people have now virtually disappeared from your blog. Great street style…authentic, sweet, joviale… big smile! I hope I’ll be wearing something as colourful when I’m her age. Beautiful & unexpected! This is so you Scott! this is the kind of diversity your eye has been in desperate need of. this woman looks awesome!!! This reminds me of all my zias(italian for aunt). Always these types of dresses with baubles accompanied with matching purse and necklace. This photo just made my day. Thanks for including age and body shape in your commitment to visual style diversity. More, please! THANK YOU for making my day with this lovely photo. You can totally catch such variety of fashion styles in just one space. Love the necklace! She looks so elegant and confident! Great look. Thank you for making my day. Beautiful! My dear, late, grandma never left the house unless immaculately groomed. She taught me well. This lovely lady shows me, as well, why you should DRESS LIKE YOU MEAN IT. She has respect for herself and those around her. What a wonderful example of manners and grace. Thank you for sharing. i love this picture. shows what necklace and shows can do. Super!!! that dress would surley catch my eye too – so colourful – so summery!!! at last! a stylish woman who is not young or stick thin. please find some more for us as i know there are plenty out there. Just goes to show that style is timeless! Such beauty in her confidence! She makes me happy and hopeful! Let’s have more like her. This instantly reminded me of my nonna in Italy. Due to the distance between us unfortunately I don’t get to see her often, but when I do she never seems to be lacking in floral dresses, pearls and curls. What an adorable lil Granny. Love this. a touch of reality in the irreal world of fashion. I am so so so glad to see this picture! It” humanizes” our fashion sense. Thank you for your sensibility! :) I love your work!! Finally! An older woman agrees to join your ranks! She’s really beautiful in your perfect shot.– and that looks like a two-piece pant outfit… not a dress! Please let me have this much grace and style as a woman of mature years. And please let Scott document it here as further proof of his own broad mind and keen eye. Nothing like Italians, young or old, to show style and grace. The expression on her face is lovely. Did everybody realize that this lady received more comments than anybody else lately? And…. all favourable! Bravo for putting a normal size person on here!!!!!!!!!! She looks like she’s going to size you up in a few moments, tell you you’re too skinny, then try to feed you. If you decline she will shake her head sadly and sigh. Then try to feed you again. Then you will feel guilty, and even though you’re not really hungry, you’ll eat something just to make her happy. Okay, maybe that’s confusing her with my grandma, but you just know she’s probably the same. I love this photo! Not that your others are bad, but finally someone who is not in their 20′s-30′s, rail thin, and connected to the fashion industry in some form. Yay!!! A true street sartorialist photo! ready for summer… i love italian women of all ages! beautiful – you just inspired me to take some photos of my grandma to put on my blog. I want this lady’s dress! What a beautiful print. She’s beautiful. Thanks for this moment… sweet. After years, this is the first time posting on this site. Regardless of whether I love her style or not, it’s about time seeing someone who is not young and thin. Awesome! Simply amazing. In one second, I was transcended to her youth. I saw exactly who she was and reflectively, still is. She’s got a spunky personality that I’m sure was ever so present in her younger years. Render me speechless. This is ranking near the top of my favourites of yours, list. Nice to see a woman my age dear Sartorialist. Please find some more real women. There are many of us still out there waiting to be found you know! The photo is art. More, please! She is lovely. Older, but still fashionable, exciting and I will bet delightful to photograph! This picture really made me smile, thank you! You’ve captured pure joy. how cute!! :) i want to give her a hug! beautiful! I wish you had more photos of ‘older’ people…. She is lovely. Same hair, oh God, its just the same hair!! !